BAR BEER BOOZE AND FUN JOKES! 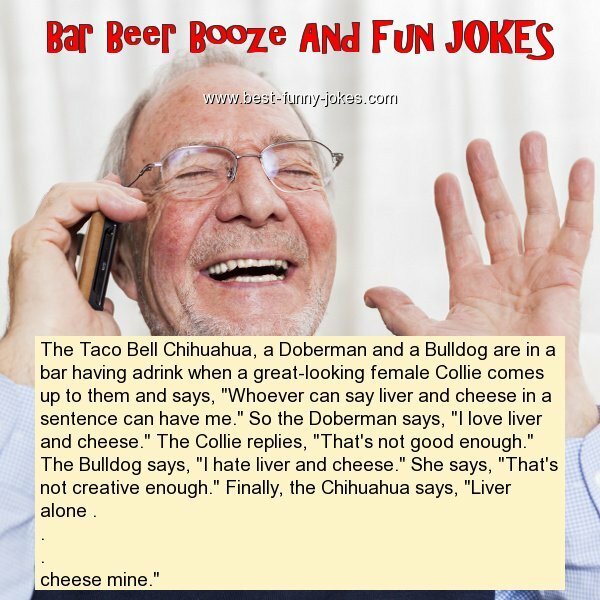 The Taco Bell Chihuahua, a Doberman and a Bulldog are in a bar having adrink when a great-looking female Collie comes up to them and says, "Whoever can say liver and cheese in a sentence can have me." So the Doberman says, "I love liver and cheese." The Collie replies, "That's not good enough." The Bulldog says, "I hate liver and cheese." She says, "That's not creative enough." Finally, the Chihuahua says, "Liver alone .